Calcium is an essential mineral required for numerous biological functions. In circulation, calcium is found in three different fractions, anion-bound, protein-bound and free or ”ionized”. The amount of calcium in each of these fractions is dependent on the concentration of hydrogen ions, anions and plasma proteins. In healthy ambulatory patients, total calcium measurement (the sum of the fractions) provides an accurate picture of overall calcium homeostasis. However, in patients with abnormal pH, or altered protein or anion concentrations, ionized calcium (iCa2+) is the preferred test. This is because iCa2+ is the biologically active form of the mineral analogous to free hormone or free drug concentrations, where the free fraction is the most clinically relevant. Although iCa2+ provides an accurate assessment of calcium, it has stringent sample collection and handling requirements based on the need to limit pH change. As a means to correct for pH change and avoid the sample handling requirements, laboratorians have developed pH adjustment equations. These equations provide an iCa2+ result standardized to a pH of 7.4. While this is effective at correcting iCa2+ for pH change due to the loss of CO2 in samples collected in vacutainers from healthy patients, it may be erroneous in patients with abnormal pH. This article describes the utility of iCa2+ measurement, the basis of the pH adjustment, and reasons to avoid it. Calcium is an essential mineral required for numerous organ systems from skeletal structure to blood circulation. Approximately 99 % of the total body calcium is sequestered in teeth and bones. The remaining 1 % is distributed between the exchangeable extracellular and intracellular pools. Intracellular calcium is involved in muscle contraction, hormone secretion as a second messenger, glycogen metabolism, enzyme activity and cell division. The extracellular calcium pool is involved in blood coagulation, enzyme activity and bone mineralization. The circulating extracellular calcium pool exists in three different states, free or ”ionized”, anion-bound and protein-bound. Protein-bound calcium accounts for ~40-45 % of the circulating total, the majority of which is non-covalently bound to albumin. Albumin is the predominant calcium-binding protein, containing ~80 % of the protein-bound fraction; this predominance is explained by the high concentration of albumin in blood and the fact that each albumin molecule has ~30 potential calcium-binding sites. The remaining ~20 % of the protein-bound fraction is associated with other serum globulins. The anion-bound pool accounts for ~5-10 % of the total circulating calcium and is complexed with phosphate, lactate, free fatty acids and citrate. Finally, the free or ionized calcium pool accounts for ~45-50 % of the total calcium in circulation. This pool is equivalent to free hormones or free drugs, which represent the biologically active fraction of a larger total amount in circulation. Ionized calcium is the form of the mineral that binds to G-protein-coupled calcium-sensing receptors and is tightly regulated by parathyroid hormone and 1,25 hydroxyvitamin D.
Technically, protein-bound and anion-bound calcium is ionized, but it is only the free pool that is referred to as ”ionized calcium”; the term ”iCa2+” will be used through the rest of the article to represent the free bioactive fraction at the heart of this discussion. When it comes to calcium measurement in the clinical laboratory, there are two options, total calcium and iCa2+. Total calcium measurement is the sum of aforementioned subfractions (protein-bound, anion-bound and ”ionized”). Total calcium measurement is widely used because it is an accurate representation of calcium homeostasis in most cases and can be included as part of a routine blood collection, for example as part of a ”CHEM-8” or basic metabolic panel (along with sodium, potassium, chloride, bicarbonate, blood urea nitrogen, creatinine and glucose). Typical automated analytical methods for total calcium rely on the formation of color complexes with calcium-sensitive dyes, such as o-cresolphthalein and arsenazo III; other methods include indirect potentiometry, calcein fluorescence and atomic absorption spectroscopy. While useful in many patients, total calcium measurement can be misleading in cases where the concentration of circulating protein is abnormal. Thus, total calcium will be decreased in patients with protein loss due to nephrotic syndrome or impaired protein synthesis due to liver failure. While there are several widely used correction formulas for estimating total calcium relative to changes in albumin (e.g. adjusted Ca (mg/dL) = total Ca (mg/dL) + 0.8 [4 − albumin (g/dL)]), it is known that these formulae are subject to error when total protein concentration and pH are abnormal. It is for these reasons that there are clinical and analytical needs for direct measurement of iCa2+. Ionized calcium is measured almost exclusively by an ion-selective electrode. This method uses a calcium-ion-sensing compound immobilized within a plastic matrix, such as polyvinyl chloride. The presence of calcium ions creates an electrical potential relative to a reference electrode, which is measured and ultimately converted to an iCa2+ concentration. The challenge of iCa2+ measurement comes from the stringent preanalytical requirements. Because the circulating calcium subfractions (protein-bound, anion-bound and ionized) are in equilibrium, the amount in each subfraction changes if the equilibrium is affected. The equilibrium is most affected by pH, because binding of calcium to protein is particularly pH sensitive. Thus, pH change is inversely proportional to the concentration of iCa2+ (Fig. 1). This relationship is predictable and can be modeled mathematically; as will be discussed later, adjustment equations are sometimes used to try and correct for pH. The concentration of iCa2+ changes by ~5 % for every 0.1 unit change in pH as hydrogen ions effectively compete with iCa2+ for available negative charges on proteins. An increase in circulating hydrogen ions leads to decreased protein-bound calcium and increased circulating iCa2+ (Fig. 1). FIG. 1: The effect of pH on protein-bound and free calcium. As pH decreases, H+ displaces Ca2+ from binding sites and the amount of iCa2+ increases. Conversely, as the blood pH increases, albumin and the globulins become more negatively charged and bind more calcium, causing the amount of iCa2+ circulating to decrease. The pH dependence of iCa2+ also reveals the reason for the stringent sample collection requirements: anything that affects the pH of the sample will change the iCa2+ concentration. Unfortunately, there are some sample collection practices that can artificially change the pH and cause an inaccurate iCa2+ result. Prolonged use of a tourniquet or the practice of having the patient clench or pump their fist can increase lactate production, thereby lowering the pH and falsely increasing the amount of iCa2+. In addition, iCa2+ specimens must be collected under anaerobic conditions to avoid loss of CO2 and pH increase. Finally, any significant time delay between collection and iCa2+ measurement can cause an apparent hypercalcemia due to metabolic activity (in vitro pH decrease). It can be inferred from Fig. 1 that iCa2+ levels are often increased in patients with metabolic or respiratory acidosis, whereas in metabolic or respiratory alkalosis iCa2+ is decreased. In the absence of changes in protein or anion concentrations, total calcium remains within the reference interval, but an iCa2+ would reveal that the patient is either hyper- or hypocalcemic, respectively. In cases where protein, anion or hydrogen concentrations are altered, iCa2+ is the preferred diagnostic test. Thus, iCa2+ is the preferred test in patients with acid-base disorders, those receiving blood transfusions containing citrate anticoagulant, those with late-stage renal disease, and hospitalized or critically ill patients. Now that the reason to measure ionized calcium is defined, we can address the issue of pH-corrected iCa2+. The practice of pH-adjusted calcium goes back decades, where it was validated by some of the pioneers in iCa2+ measurement (Fogh-Andersen et al. 1978, Fogh-Andersen et al. 1981). In the early literature it was recognized that iCa2+ was clinically useful, but that a change in pH that occurred after collection would affect the accuracy of the results. While some early methods relied on using CO2 tonometry to biophysically drive the pH to 7.4 (Schwartz, 1977), it was determined that iCa2+ could be adjusted mathematically to a standardized pH of 7.4. During the development of this method it was established that there is a sigmoidal relationship between iCa2+ and pH between 6.5 and 8.5 (Fogh-Andersen et al. 1978). In a more narrow pH range (7.2-7.8), this is effectively linear. Conceptually, if the relationship between pH and iCa2+ is known, then the iCa2+ concentration could theoretically be calculated for any pH (Fig. 2). More recent literature supports the accuracy of pH-adjusted iCa2+ in patients with disorders of calcium homeostasis (Thode et al. 1990). This practice seems to make sense – if a patient has a pH of 7.4, but over the course of collection and transport the pH of the sample has drifted down to 7.2, then surely the result should be corrected to 7.4. Furthermore, if iCa2+ can be corrected for pH, then samples could be collected in vacutainers, where pH is increased due to equilibration of CO2 with air in the tube or room air after it has been opened for analysis; note that pCO2 in air is low so pCO2 decreases with air contamination, driving pH higher according to the Henderson-Hasselbalch equation. Thus, the practice of pH-adjusted iCa2+ was developed as a convenience to avoid stringent sample handling. FIG. 2: pH-adjusted iCa2+ vs. measured iCa2+. 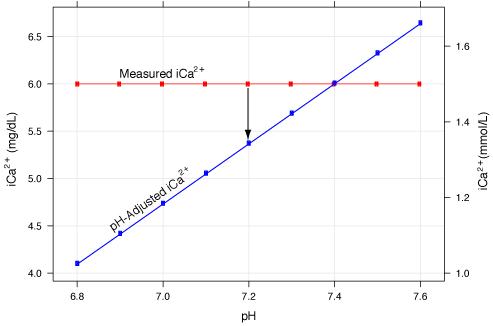 The blue line represents the pH-adjusted iCa2+ value calculated from the red line. The red line represents a measured 1.5 mmol/L (6.0 mg/dL) without adjustment. The blue line is derived using the equation: iCa_corrected=iCa_actual[1-0.53(7.4-pH_actual)] where the measured ionized calcium concentration (iCa_actual)=1.5 mmol/L (6.0 mg/dL). So what is the issue with pH-adjusted iCa2+? The data support that iCa2+ measurement should be reported at the pH of the patient. The problem occurs when the patient’s pH is not 7.4. In essence, the iCa2+ concentration cannot be accurately corrected when the patient’s true pH is unknown. The correction equation only includes the measured iCa2+ and the measured pH and is ”adjusted” to a pH of 7.4. Using Fig. 2, consider that the patient has an acid-base disorder with a pH of 7.2. The measured iCa2+ is 1.5 mmol/L (6.0 mg/dL), but pH adjustment would yield an iCa2+ of 1.3 mmol/L (5.3 mg/dL), an error of approximately 10 %. Thus, correction of iCa2+ demands knowledge of the patient’s pH, which will not be possible in the presence of preanalytical error. To put this plainly, one cannot use the pH from a sample with preanalytical error to correct iCa2+ for the same error (both pH and iCa2+ may be incorrect). Another problem with pH correction is that iCa2+ is buffered by lactate (the anionic pool). In cases of lactic acidosis, pH correction can result in overcorrection of iCa2+. Another issue is that there are many possible equations that may be derived from the iCa2+-pH relationship. If a linear equation is used (as it is widely done on modern blood gas analyzers), then it is by definition going to be inaccurate at extremes of pH (most have a disclaimer to not use them outside of the range of 7.0-7.8). It is also clear that the variability in iCa2+ with concentrations of protein and anion pools (Wang et al. 2002) is likely to result in inaccurate correction in patients with abnormal protein or anion concentrations. This is exemplified in patients undergoing hemodialysis, where pH-adjusted iCa2+ is erroneous due to therapeutically induced changes in pH, albumin, phosphate and other anions (Rudnicki et al. 1992). In short, iCa2+ is arguably most useful in patients who are ill, but it is these same patients in whom adjusted iCa2+ is most likely to be erroneous. Despite these issues, some have advocated for pH-adjusted free calcium measurements in defined clinical scenarios. In community outpatient settings, where most patients do not have an acid-base disorder, one could assume that patients will have a ”normal” pH and therefore could use pH-adjusted iCa2+. However, to quote the CLSI guidelines on iCa2+ measurement, ”The assumptions, in this case, severely limit the usefulness of this result” (D'Orazio et al. 2001). A more practical approach is to measure total calcium in those who do not need a iCa2+ measurement and to follow the stringent sample collection requirements for iCa2+ in patients who do need free calcium measurement. Fogh-Andersen N, Christiansen TF, Komarmy L, Siggaard-Andersen O. Measurement of free calcium ion in capillary blood and serum. Clin Chem 1978; 24, 9: 1545-52. Fogh-Andersen N. Ionized calcium analyzer with a built-in pH correction. Clin Chem 1981; 27, 7: 1264-67. D’Orazio P, Toffaletti JG, Wandrup J. Ionized Calcium Determinations: Precollection Variables, Specimen Choice, Collection, and Handling; Approved Guideline—Second Edition. CLSI document C31-A2 (ISBN 1-56238-436-8). NCCLS, 940 West Valley Road, Suite 1400, Wayne, Pennsylvania 19087-1898, USA 2001. Rudnicki M, Frølich A, Haaber A, Thode J. Actual ionized calcium (at actual pH) vs adjusted ionized calcium (at pH 7.4) in hemodialyzed patients. Clin Chem 1992; 38, 7:1348. Schwartz HD. New techniques for ion-selective measurements of Ca24 in serum after pH adjustment of aerobically sera. Clin Chem 1977; 23, 611. Thode J, Holmegaard SN, Transbøl I, Fogh-Andersen N, Siggaard-Andersen O. Adjusted ionized calcium (at pH 7.4) and actual ionized calcium (at actual pH) in capillary blood compared for clinical evaluation of patients with disorders of calcium metabolism. Clin Chem 1990; 36, 3: 541-44. Toffaletti JG, Wildermann RF. The effects of heparin anticoagulants and fill volume in blood gas syringes on ionized calcium and magnesium measurements. Clin Chim Acta 2001; 304: 147-51. Toffaletti JG. Ionized Calcium in Clinical Chemistry: Theory, Analysis, Correlation, 5th ed. Kaplan LA, Pesce AJ. Mosby Elsevier, St. Louis, Mo., 2010. Wandrup J, Kancir C, Hyltoft Petersen P. Ionized calcium and acid-base status in arterial and venous whole blood during general anaesthesia. Scand J Clin Lab Invest. 1988; 48, 2: 115-22. Wandrup J, Kvetny J. Potentiometric measurements of ionized calcium in anaerobic whole blood, plasma, and serum evaluated. Clin Chem 1985; 31, 6: 856-60. Wang S, McDonnell EH, Sedor FA, Toffaletti JG. pH effects on measurements of ionized calcium and ionized magnesium in blood. Arch Pathol Lab Med. 2002; 126, 8: 947-50.